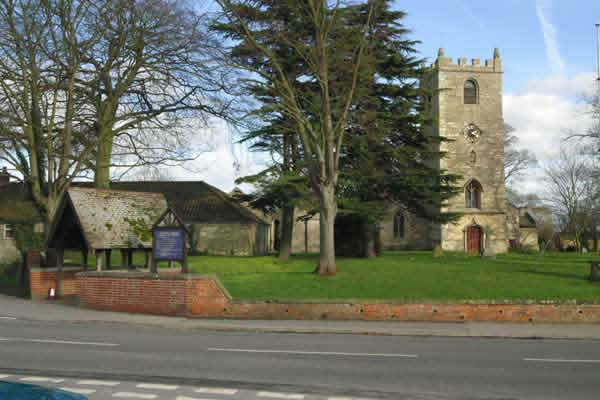 Its population is approximately 4,500, and has its own local Welton News publication, published monthly, a brilliant publication, which contains many Parish Council matters. Special mention should be made of the hard-working Health Centre Staff, the Post Office staff, Post men and women, and the Pharmacy staff who give such helpful and friendly service. The jewel in the crown is William Farr School-which attracts many parents to Welton, being one of the best schools in the country. Under the leadership of Paul Strong, and the dedicated staff and teachers, William Farr has achieved brilliance over the past few years. The NHS should not be destroyed by Lansleys Social Care Act-which was merely a prelude to privatising more services under TTIP. It allows private companies to tender for NHS services, and more private treatment within NHS hospitals. Keogh's plan to shut A & E departments is complete insanity! Show some balls and speak out forcefully!!! Be very wary of Hotpoint products! We have had many early faults with fridges, freezers, dishwashers. A neighbours dishwasher flamed and burned. Be very wary of any HP products. We have has three HP Colour Laserjets-all failed very quickly-asnd there is NO HP repair network, many rippoff agents! Warning:We accepted a quotation of £3520.80 for a straightforwards garden wall rebuild, by Boss Construction. The final submitted bill was £2000 above this. Keep your dog off the pitches, clean up after your dog, keep on a lead and there is no need for this pointless fence: take down the fence!!! "We realise that when the schools break for summer that there are holidays and days out planned and it can be easy to put off giving blood. We’re asking you try to keep your appointment if at all possible but if you can’t, then please let us know by calling 0300 123 23 23 so that your appointment can be offered to someone else. "There is also a bank holiday at the end of August, making a date to donate and keeping your appointment even more important as this is another time of year when blood donation can dip." It is also easy to book through mobile apps for Windows, Android and Apple devices. To download the app, search 'NHSGiveBlood' in the app store. It allows the big private U S corporations to sue governments in secret courts if they are disallowed from bidding to provide private services to the NHS, already softened up by the HSCA act. Many people agree that this is a step towards NHS privatisation which is harmful and will result in big costs. Spare a thought for our hardworking post men & women: for years they deliver our mail, letters and even large parcels, through hail and scorching heat. Mail arrived on the dot at 11.00am. Now they have been ordered to use a van to the head of each road, and push a trolley, rather than use their bikes-ostensibly because of "health and safety": ridiculous!!! My belief is that this is a privatised management strategy to push employees into early retirement, to reduce numbers & costs... As a result, we have to collect large parcels, and mail often not arrive until the late afternoon. Lincolnshire County Council propose to close Welton Library and run a mobile substitute. Poll Tax can rise, or cuts be made. Welton library should not be closed-if savings are deemed to be necessary, reduced hours or opening days are infinitely preferable to closure-once closed, it may never reopen. 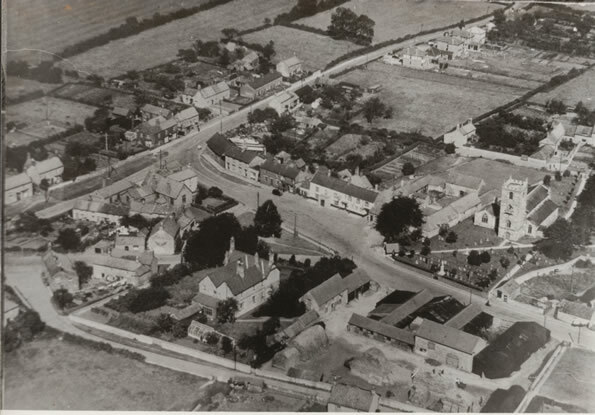 Surely our new library deserves a reprieve from the cuts deemed necessary to reverse the mad spending of yesteryear.Write to the Leader and members of LCC to suggest NO CLOSURE, and fill in the Welton Parish Council's survey. Government has already wrecked Neonatal, A & E, Maternity care in Lincoln. Warning to anybody using Valentine Retail Park carpark for Next, TKMax, The Range, Asda. The carpark landowner uses Parking Eye to issue "demands for payment" of £80 if you inadvertantly overstay the 3 hour limit. Most shoppers are blissfully unaware there is any limit. MoneySavingExpert.com has a forum on ParkingEye. I understand the key is whether any signs exist easily readable by an average astute parker. Their cameras cannot prove who was in the car. Most people simply pay up.Their "invoices" are not a fine (dolled up to look like a police letter.) Has this ever been tested in court-if the notices are not clear and visible. MoneySavingsExpert's advice is to ignore-but you need to be brave, ask for a POPLA code within 35days.Beware, boycott, write to the store managers, boycott...Use Amazon! system brilliant, and a credit to this ambitious amateur company. go to the next production! There are few pieces of legislation that have caused such debate, furore and confusion as the Health and Social Care Bill. Since I started writing about it more than a year ago, I have received many letters and emails about it. Readers are concerned - but also deeply confused. They are not alone. Fellow medics, managers and nurses have cornered me in the hospital canteen and quizzed me about it. I have even been invited by members of the House of Lords to meet and explain it to them. I am not surprised that people are confused. I’ve spent many hours immersed in the Bill and in the subsequent amendments, drafts, briefings, notes and critiques and I can attest that it is a particularly complex and obtuse piece of legislation - and about three times the length of the 1946 Bill that brought the NHS into existence. But if this Bill is passed, it will lead to the most extensive reorganisation of the NHS ever undertaken, so I think it’s vital that everyone understands it so they can decide for themselves if this is what they want for the NHS. The Bill addresses the way that the structure and delivery of health care in England (although not Scotland or Wales) is organised and managed. It eradicates the Primary Care Trusts and Strategic Health Authorities, introduces a new structure and gives existing organisations such as Monitor (an “economic regulator”, see below) and local authorities additional powers. Until now, the health of the nation has ultimately been the responsibility of the government, with ministers directly accountable for providing or securing a comprehensive NHS. There are various parts of the Bill that either directly or indirectly alter this. Under the Bill, no single person and no single organisation will be responsible for meeting all the health care needs of all the people living in England or specifying the services to which they are entitled. A number of different bodies will have the power to determine the health care you can receive through the NHS. The power to determine the services that make up the NHS will be transferred from the Secretary of State to newly created Clinical Commissioning Groups (CCGs), which are unelected. Members will include GPs but also company chief executives who can, if they wish, outsource decisions about the appropriate level of services offered to companies with commercial interests. This is what the Government means when it says it is handing GPs £60 billion of NHS money. Services such as mental health provision, facilities for pregnant women, preventive medicine, aftercare and services for children could be substantially reduced by this power to save money, generate revenue or redirect patients into the for-profit sector. In addition, the Government is planning to establish a parallel health service whereby some services, including screening, immunisation and vaccination will be handed to local authorities with the discretion to decide what will be provided, and to whom. This means that some services that were formerly free on the NHS may become chargeable, as undeT\h«se changes, CCGs and local authorities will have the power to make unilateral decisions about what can and can’t be provided. Many of the Government’s current powers and responsibilities for health care will be handed over to an economic regulator known as Monitor. This quango is composed of unelected and unaccountable individuals. It will not have overarching responsibility - which the Government does currently - to ensure that everyone’s health needs are met. Instead, one of its main concerns is economic viability. It will have the power to decide, on purely financial grounds, if an area loses its existing range of hospital services, such as A&E departments, with no duty to consider alternative provision. With so many different providers of health care created under this Bill, those with complex health care needs may not receive the joined-up medical care that the NHS now works hard to provide. Also, providers will come and go over time, as services prove themselves to be viable revenue generators or not. This risks disruption and confusion for patients with a marked discontinuity of care. Less profitable patients - those requiring complex levels of care from multiple individuals and areas of expertise, for example - may be sidelined by these private companies. The Government has already conducted an assessment of the financial and public health risks of implementing this Bill in a document called the “Risk Register” but has so far refused to release this information for independent analysis. On November 2 2011, the Information Commissioner ruled that the Risk Register relating to the Bill should be released. The Government has refused and has launched an appeal against the decision, further fuelling suspicion as to what it contains. Despite the political rhetoric, nowhere in the Bill does it actually state that GPs are required to do the commissioning or purchasing of services in the new market In reality, it is likely that few will be able to show the necessary competence in the highly technical business of buying health care. Instead, the Bill allows CCGs tocontract out commissioning functions to private accountancy, health insurance and management consultant firms, which will be able to decide what care is provided free at the point of use through the NHS and what is not. This means that profit-making companies will be able to provide your clinical care and also decide what you’re entitled to under the NHS and from which care providers. Companies will also design and set the care targets that doctors must meet. There is the potential for commercial conflicts when the needs of shareholders come between doctors and patients. Providers, too, can reduce levels of service provision and entitlement to NHS-funded care and there are no restrictions on charging for non-NHS care. The “autonomy clause” in the Bill gives CCGs and providers extraordinary freedom. We have already seen some CCGs refuse operations for obese patients, despite national guidelines stating their obesity should not preclude them. The Bill also increases the current cap placed on hospitals regarding the amount of income they can generate from privately paying patients. Now, up to 49 per cent of income can be generated from private income. This means that almost half the beds currently used for NHS care could be given over to private patients. This could create a two-tier system in hospitals and drain resources, as well as create a conflict of interest, with hospitals having a clear incentive to encourage as many patients as possible to use the private half of their facilities. Moreover, hospitals can decide when to discharge patients. The requirement for coordinated discharge and aftercare of patients between health and social care is abolished in the Bill. The Government has tried to silence critics of the Bill by claiming they are distorting or misrepresenting the legislation. But the points I’ve raised are in the detail of the Bill, there in black and white, for all to see. It might be that none of this concerns you - or you may be horrified. Whatever your political leanings, health status or experiences of the NHS, it is YOUR health service and I believe you have the right to be informed about what the proposals set out in this Bill will mean for the NHS. I think most people simply want a health care system that is there for them when they need it, that provides good, efficient service and that treats them with dignity and respect. They want a fair, just system that looks after everyone, regardless of their ability to pay or the complexity of their needs. I shall leave it to you to decide whether this Bill is safeguarding what has, until now, been the ruling principle of one our most valuable institutions - the NATIONAL Health Service. 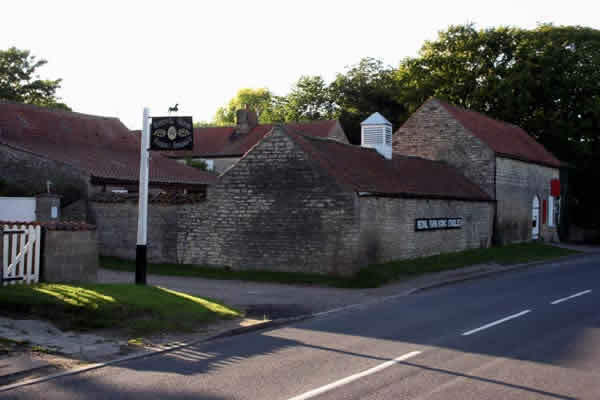 At peak shopping times, (and during parent parking on Lincoln Road, pickup from William Farr) parking in Welton can become tedious, due to lack of parking provision for the enlarged Coop, Post Office, Health Centre, Newsagents, hairdressers etc. Very occasionally, it makes perfect common sense to park half on the verge to avoid blocking HGV's and buses. If a fire engine or ambulance is blocked, they will probably barge your car out of the way; if a bus is blocked, the police may be called. SCAM WARNING: Do not touch emusic.com with a bargepole! They offer "legal" music downloads with a free trial, but take money £25) from your credit card every month...Cancel your credit card and get a replacement! You will never recover your losses!!! Apologies for my absence-Octagon Technology (who also host Welton Parish Councils sites...) claimed I did not own www.welton-village.org.uk anymore. It is easy to get your domain retagged so you control it, not Octagon Tech. I can host sites for no charge. David Cameron asks what makes us unhappy-this would make us happy! The present "bit by bit" approach can be critisised as being political manipulation, and each and every decision is challenged by different interest groups. 10% accross the board is a far better strategy. We should stop free movement within the EU: we have already too many people in the UK, and in the world: a birth control incentive is urgently required. Food and water are in short supply already...., and stop free EU immigration, reopen our border immigration controls. We are an island, best placed to stop terrorism. We have not enough money to keep rail, air and roads operating in severe winters: stop bleating and do the best we can-snow tyres, fwd or 4wd Buy bags of cement and adopt a pothole! Local village supermarkets should have 4WD trucks, nor artics for severe winter use. Each village should have one miniplough /gritter for pavements, one snowplough/gritter for side streets. Don't expect air or rail to operate insevere winters: you are stupid to live far from work. Only drive if essential services. Swedish airports invest in stateof the art sweeper/snowploughs which leave a de-iced pure clean black tarmac runway… How can we trust a broke Spanish company to run Heathrow!!! waste money on further bids. If US and UK forces act against the enemy contravening regulations, morally, we do not have the upper hand. Torture is wrong. Wrong treatment of war suspewcts is wrong. Repeal the all day drinking hours to reduce binge drinking-return to licensing hours-plus 1 hour for restaurants, and ban 24 hour drinking. Repeal the devolution laws-all the UK should have one government, same NHS fees, old age care system, tuition fees etc. Sweden pays higher taxes to look after it's aged population. OAPs should not have to sell their homes to buy care. The US should not reveal secrets: some nutter like Wikileaks will always publish them…. We need more nuclear power, import less gas and oil. My own opinion is that as a bankrupt nation, we cannot have everything that is desireable-many services and benefits will decline until solvency is regained. Canada and Australia made 10%+ cuts, and increased tax by 10%+. Such firm unequivacal action saved their economies: factional arguments, demonstrations and arguments are pointless and divisive. We must each show charity to the unfortunate, support them by giving homes food and shelter until the balance sheet improves. 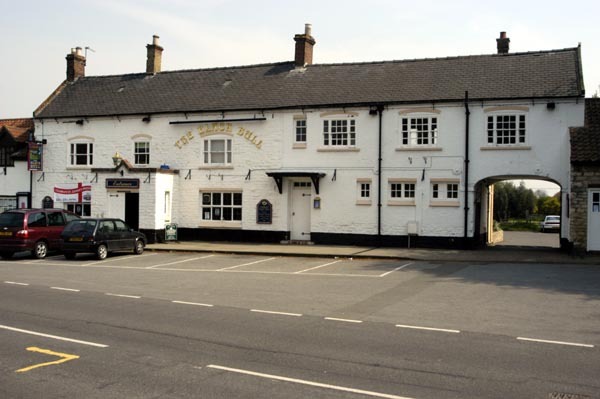 The Black Bull is now at full potential: the food, friendliness, ambience are all very high. 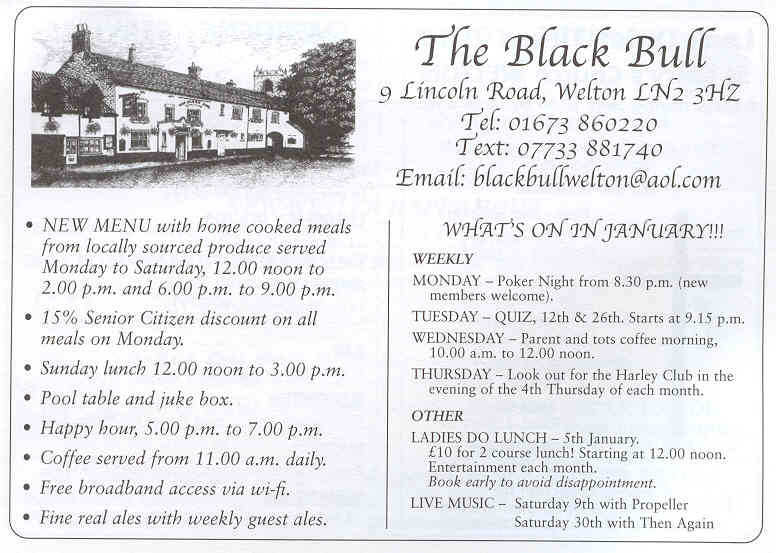 Please try The Black Bull and help ensure their continued success-and please recommend The Black Bull to your friends. glass windows as well as a memorial in the churchyard.